I had some free time to explore New York. This was my first time there, so it was quite interesting for me. I spent most of my time in museums. New York has some really spectacular museums - you could spend an entire day or two in a large one, if you really wanted to see all the exhibits. Here's a picture I took at the Natural History Museum. The museum has plenty of dinosaur fossils and the picture shows one of the largest ones. When you're standing right there, close to the fossil, it's pretty remarkable to think that once upon a time, such a massive creature was real and alive, and stomping and stamping its way around planet Earth. I also visited the world-renowned Metropolitan Museum of Modern Art. Quite delighted to see many famous paintings which up till then, I had only come across in books, postcards etc. 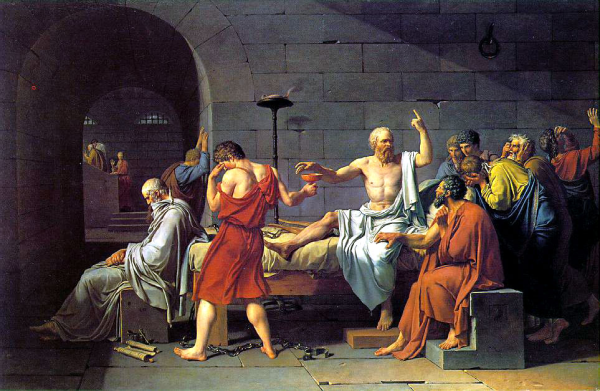 Here's one of the paintings, The Death of Socrates. 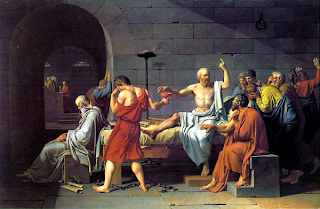 A painting that you would appreciate a lot more, if you saw the real thing in full size, and also know the story of how Socrates died. I also went to the Apple store to buy an iPad for a friend. The iPads are still selling like hot cakes. You can't get them unless you place a prior reservation. And the rule is that the reservation lasts for only 24 hours - you need to pick it up within that time. I would have bought one for myself, but I'm not sure how an iPad would gel with the data plans in Singapore. 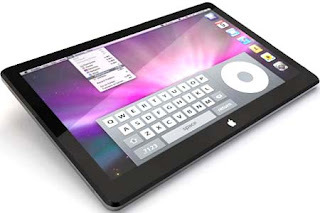 It seems to me that in the long run, an iPad is the way to go, for a book lover like me. I've often had to restrain myself from buying more books, because my house is already full of books and they take up so much space. I throw away and give away books, and yet I still have so many. With an iPad, I could switch to reading ebooks. Right now though, I'm not too sure what the range of available book titles would be like. I'm back from New York. I passed my reality TV show - not with flying colours, but I passed, and that's that. So I guess I'm on track for promotion early next year. One really interesting thing we did was a complex business simulation exercise. The course participants were broken up into six groups. Each group was supposed to be one company. At the beginning of the game, each company has exactly the same balance sheet, sells the products and owns the same kind of factory equipment. Each group then has to make a set of decisions, on issues like how much to invest in R&D; how much to spend on employee training; how many employees to hire or fire; whether to purchase new industrial equipment or not; and what price to set for the products. At the end of each round, each team's decisions are entered into a complex computer model. Decisions made by any one team influence the result of all other teams, because the parameters of the game are that all six companies are operasting in the same market. The model then spits out a detailed set of results, which are publicly announced. These include results such as which team gained the most market share; which team wins an award for "Best Factory"; which team produced goods with the highest quality; at what price each team sold its products etc etc. Then there is a set of confidential results for each company, detailing its financial performance in that particular round, and also details about its inventory holdings, and its productivity ratios. The objective of the simulation exercise is to see which team can generate the highest retained earnings, over seven rounds. The game is quite complex, and takes into account a wide range of factors such as the depreciation of assets over time; the life cycle of the factory machines; fluctuations in market demand; and changes in interest rates. The teams also have options to do things like borrow money from the bank. Each team can also carry out quality improvement projects; engage external consultants; purchase market forecast reports etc. Each of these decisions come with a price, of course, and each company has a limited amount of money. The game ran over a period of one and a half days. Anyway, I was the CEO of my team and we won - yes, we were No. 1, making 67.1 million dollars over seven game periods. You can think of the game as a very complicated kind of Monopoly. The other interesting feature of the game is that each team had a psychologist sitting in the room of each team. The psychologist was there to observe each participant in the team. This part of the exercise was to focus on intrapersonal and interpersonal skills. After the game, each participant gets to discuss his own performance with the psychologist, who will comment on the participant's observed behaviour. Each participant also receives a grade, on a very broad set of different criteria, such as whether he was collaborative; whether he communicated clearly; whether he was confident etc. Although I was the CEO of the winning team, I only got an average score as CEO. The psychologist said that my weakness, under time pressure, was in commanding and persuading my team members, whenever I had to articulate an innovative strategy or complex idea. I was also criticised for being poor in delegating. I personally over-focused on details, when as CEO I should be splitting up the tasks more, and getting my team members to do the analysis. Innovation and far-sightedness were noted, as my key strengths. In Round 2, when my team members were mostly thinking about Round 2, I was already strategising and planning ahead for Rounds 5 to 7. Got an email from Christine Lindop, a freelance editor with Oxford University Press. She is working on a new book - a collection of short stories specially edited for readers for whom English is a foreign language. This is part of a series entitled Bookworms World Stories, which showcase the work of writers in English from different parts of the world. Christine's volume is scheduled for publication in 2011 and will consist of stories from Asia. I'm known for my poetry rather than for my short stories, but Oxford University Press told me that they would like to use one of my poems, entitled Accident, in the preliminary pages of their book. That's because my poem has inspired the title of their book, Gazing at Stars. Okay, the actual poem doesn't really look like that. The lines are arranged and spaced in a certain way, to suggest serendipitious wanderings and a sudden fall. But Blogger doesn't seem to give me any option to replicate the line arrangements - it automatically aligns all the lines for me. 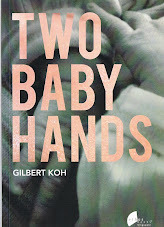 Professor Edwin Thumboo is compiling a new anthology of poetry and wanted to include one of my poems in it. My publisher emailed to ask if I had any objections. A slightly strange question, since my publisher holds the copyright for the next nine years and I have no grounds to object anyway. But anyway, I am perfectly okay and happy with the idea. Altthough in this moment he does not think of it. My son is a young child. Shells and boats excite him. Become for him an uncertain memory.